Degenerative disc disease is a general term that refers to the process of degenerative change that occurs in the discs between your vertebrae as you get older. It can occur in areas of the spine from the top of the neck to the bottom of the lumbar spine. It occurs mainly in people from around the age of 30 onwards. 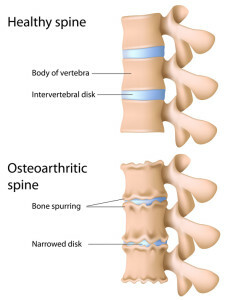 As you get older, the discs that are between each of your vertebrae begin to dry out. At the same time, the outer layer (the annulus fibrosus) can develop cracks, which gradually worsen. The discs may also develop herniated areas, which is where the central portion of the disc (the nucleus pulposus) protrudes through the outer layer. Your discs act as shock absorbers for your spine and allow freedom of movement throughout your back and neck, so as this degeneration occurs, you may also find that the mobility through your back and neck becomes more restricted. Many people with degenerative disc disease will have pain in their back or neck. The pain from this condition can be caused by a few different mechanisms. The middle (nucleus) part of the disc contains chemicals that are very inflammatory in nature, and if these chemicals come into contact with nerve endings, in either the outer layer of the disc or surrounding areas of the spine, then pain will result. The damaged discs may also put pressure on the nerve roots or spinal cord, which will lead to pain, weakness and/or numbness travelling into the legs or arms. Despite the fact that the physical degeneration in your spine will gradually progress over time, the good news is that your symptoms may not necessarily progress to the same extent. Sometimes, symptoms can even improve over time. A number of studies have shown that pain levels in this condition are actually worse in younger people than older. There are a few reasons why this may be so – the joints in the back tend to stiffen up with age, leading eventually to more stability; and also, the inflammatory chemicals that are contained within the nucleus pulposus can eventually become depleted. For some people, however, particularly if the pain levels are severe, or if there is pressure on the nerve roots, symptoms will continue to escalate with time. What is the treatment for degenerative disc disease? Most people with degenerative disc disease respond well to conservative treatment. Your doctor might prescribe medication for pain or to reduce the inflammation in your spine. You might also be referred for physical therapy. Physical therapy can help to manage your symptoms and may comprise treatments such as manual therapy, heat and other pain relieving modalities, stretching, strengthening exercises and education to help you manage your condition. For a small group of people, conservative (non-surgical) treatment will not be effective in managing the symptoms of degenerative disc disease. For these people, particularly if there are signs and symptoms of nerve compression or joint instability, surgery may be necessary. There is a wide range of surgical techniques that may be used for this condition, depending on the extent and exact nature of the damage to the disc and spine. Your surgeon will discuss with you fully the type of surgery that is recommended for you. Most people who have surgery for this condition have a good resolution of their symptoms and will go on to return to a full and active life.